If you have never played a mmo game before, picking a right class in FFXIV may be a hassle. This guide is to analysis the strengths and weaknesses of each class in FFXIV. You can have a good understanding of each class and then choose a class which is the best suitable for you! I have summarized all the classes of FFXIV based on players’ knowledge and my own experience. 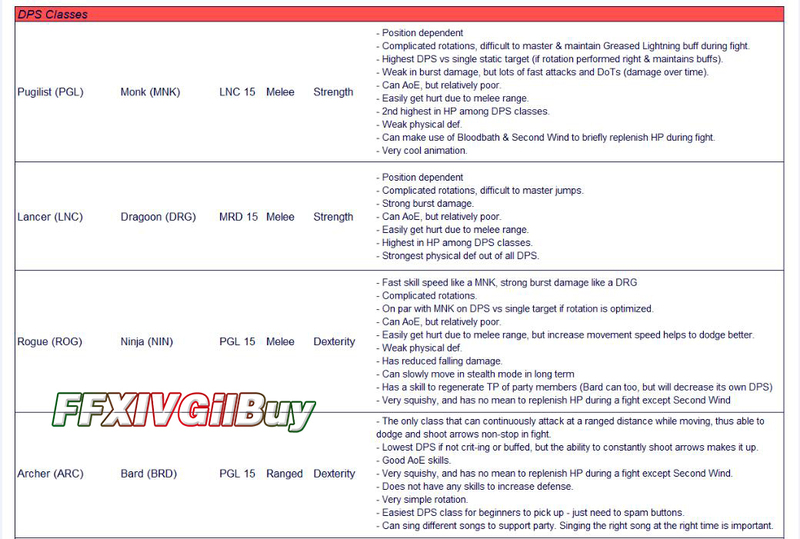 I hope all these information can give a better overview for beginners to pick a favorite class in FFXIV that suits the best. It is not limited to choose only one class in FFXIV. If you want, you can pick everything with a single character. If you can play a few classes or all classes in game, you can benefit more as you can use more cross-class skills. If you want to buy FFXIV Gil, FFXIVGilBuy provide huge amount of cheap FFXIV Gil with fast delivery and 100% security guarantee. Just like its name, the healer class is responsible for healing any injured member in a party. Also, it is responsible for creating barriers to protect others. Healer can still do some attacks, though it is weak in dealing damaging compared to DPS. The role of a tank in party is to absorb damage for the team. It is responsible for using specific skills to attract enemies to ensure the rest of the party stay safe. This is base on the building up of ‘Enmity’. Enmity can be generated towards the DPS when an enemy is being attacked by a DPS class in your team, which can result in the enemy attacking back to that DPS. Similarly, healers generate aggro to all nearby enemies by healing the party members. As a tank, it is to maintain the highest enmity on all enemies in the area so that none of them could attack the healers and DPS’s. Compared to DPS, tank class can’t as much damage to an enemy as a DPS does, however, it has skills which can create enmity to outmatch the enmity of other classes. Most of the time, tank classes can be a party leader role as it always takes the leader to walk into enemies firstly. DPS is short for Damage Per Second. The DPS class is responsible for dealing damage to enemies. It is susceptible to injuries, therefore a good DPS must know to to dodge attacks properly and perform its rotation of multiple skills to maximize damage to enemies. When you take up your job at level 30 by equipping the job’s ‘Soul Crystal’, all your stats can be greatly increased. Your main attribute can increase by 20 points and other attributes can increase by 10 points. Also, you can get access to job-specific skills. Nevertheless, your cross-class slots will be reduced from 10 to 5. What’s more, you will lose access to cross-class skills of many classes, which makes you few choices to pick from. I think this mechanism is to prevent a party being formed on the Duty Finder where people fail to do what they are supposed to do. If you don’t equip your Soul Crystal to keep all cross-class skills, you have more utilities, but you are not able to use them effectively. And you are likely to fail in fulfill your profession’s role because of lacking of job-specific skills and the deficit in stats.